If you want to get paid more for what you do, how do you go about increasing your value? In my spring Accelerator, the most popular lesson by far was how to value your work and how to negotiate your value. We ended up doing two sessions on this topic! Did you know that 60% of people don’t negotiate their salary when they get a new job according to a 2016 survey of over 2,000 adults by Glassdoor? Think about this . . . when you don’t negotiate your salary or your rate, you are letting someone else determine your value. The act of just asking for more money increases your value. If you want to increase your value, you have to first value yourself. If you haven’t already, I recommend going back and listening to episode 181, Values Are Your Compass. The process of valuing yourself begins by understanding what it is you value most in terms of how you spend your attention. It’s a crucial, but often overlooked step in the career or business development process. When you understand your values, then you can find opportunities in alignment with them. Too many of us work in situations in which we took an opportunity for the money. When you take an opportunity because it’s in alignment with your values you’ll be genuinely more excited about it and in turn, your enthusiasm will boost your value. People like working with those who share their values and they are often willing to pay more for it! 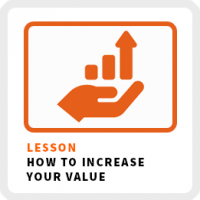 Here are 3 more exercises to increase your value. Did you know the half-life of skills is now just 5 years? Here’s what that means: from the time they are innovated to the moment they start getting replaced by a new skill is around 5 years. If you are learning a new skill like coding, marketing or something else, there’s a good chance you will need to learn a new version of it or an entirely new skill within a few years from now to just maintain your value. Acquire new skills on a regular basis. I would suggest creating an annual learning plan for new skills. Stay on leading edge of innovation. Look for new skills in demand in your industry or your area of expertise to increase your value. Try a skill mashup. Identify ways to mix and match your skills to create rare skill sets to make yourself more unique. In episode 151, I interviewed Swatee Surve, who mashed up her machine learning, gaming and healthcare skills to create a gaming app to help people manage chronic conditions like stress, diabetes and asthma. Her unique mix of skills enabled her to create a new opportunity. The more unique your skills, the more valuable they will be. Don’t price your product or service based on how you value your work. First, most people undervalue what it is they do. Second, you want to focus on the needs of your client, not yours. Take the time to figure out how your product or service saves your client time, money or frustration. How much is your solution worth to your client to have those problems solved? I’m not suggesting you let your client set your rates. I want you to see how much more valuable your service is to them when you frame it in the context of their needs. For example, I was coaching a data analyst who was pricing his work using an hourly rate of $75. If he worked on a 5-hour project that saved the company $5,000 or $15,000, he would be paid the same amount. I suggested he price his service based on a percentage of the savings he generated for his clients. Instead of getting paid $75 an hour, I recommended he get paid 10% of any savings he generated for his client. This shift in pricing strategy not only dramatically boosts his rates, but values his work based on something of critical value to the company, saving money. Instead of getting paid just $375 to work on a 5-hour project to save the company $15,000, he would get paid $1,500 by getting paid 10% of the savings he generated for them. Not only is he making more money, he has positioned himself as an investment in the eyes of his client, not as a cost. He’s also not going to get nickel and dimed on his billable hours. This compensation structure incentivizes him to save them more money, regardless of how long it takes him to work on the project. As he works with more clients, he will most likely streamline this process, reducing the amount of time to complete his work, making him even more money! Most people price their product or service based on their needs. Try pricing your services based on your client’s needs instead. I’ve interviewed over 500 freelancers, consultants and soloprenuers and you know what? You can get paid far more working for yourself than for someone else for the exact same work, especially if you are a knowledge worker. From my experience, on average, it takes about 2 years for someone to start making the same amount of money on their own compared to the income from their most recent job. By year 3 and 4, many people are making double what they made in their last job! They also have complete control over their time. They are able to create systems to make more efficient use of their time, helping them make even more per hour. Don’t believe me? Listen to my interview with Elaine Pofeldt, author of The Million-Dollar, One-Person Business. Even if you start a business and fail, you’ll get rewarded for it! You will receive an entrepreneurial bonus of around 10%. A 2016 University of California Study of 5,000 from 1979 to 2012, showed that you will get a 10% pay bump just for trying to start a business and failing compared to a peer with the exact same characteristics who kept working in a job. Employers value risk takes and those who have a wider understanding of business beyond their specific skill set.